As Friday afternoon rolls by and work proceeds, I've been sneaking peeks at the waving flag outside my office window. The brisk wind that blew me in to work has stubbornly refused to turn around and push me back home. It is -11C right now and likely cooling. I think I'm finally going to need to cover my whole face with my balaclava. This is not me. 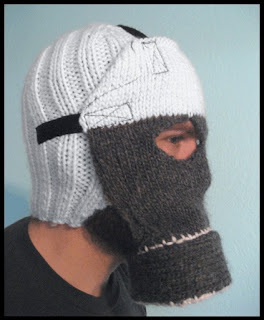 Or my balaclava. If you ever need to know which way the wind is blowing, ask a cyclist. They will be happy to tell you tales of headwinds, tailwinds or crosswinds experienced in your town that very day. That reminds me of one other bonus about riding in winter. When you aren't sure of the wind direction and you are outside, you don't have to find a flag or windsock or watch the trees or anything. Just keep on eye on your breath, or any nearby chimney. A local cyclist who reads my blog and goes by "Skyers" commutes in the opposite direction I do here in London. I guess it is just as well that the wind has remained the same, because if I got my wish for a tailwind both ways, he would have been totally screwed over. I wouldn't wish that on anyone. It seems to me that Mother Nature can be tricky enough without my selfish wishes adding to the mess. I'm fortunate. My new commute usually has a morning tail wind when the days are coldest. Maybe that's partly why I'm bemoaning the passing of the year's coldest week. I bet the guy in the picture would like my New Arm Warmers Made From Old Socks. Steve - Yeah, I read that bemoaning. Huh. jeff - I love that one. PaddyAnne - I have no doubt. I find riding a bicycle a lot like sailing. You can tell where your destination is by where the wind is coming from. christopheru - I'm sorry, but I have bad news. You are crazy. I am crazy. Riding a bike in subzero does not make normal people happy. It makes crazy people happy. If happiness is the goal, we are having success in finding some on the road where others do not. But we are crazy. Whew. Good. For a minute there I thought I was not crazy. Good to get that affirmed. Yes the ride home was much better than the ride in. I was thinkin about you and how your face must be frozen if you dont wear somthing to cover it. How many flags do you get to see on your commute? I only see 4 Canada Flags. This means I am usually about 2km into my 10 k ride before I get visual evidence of the wind direction. I expect that the numbers will be much higher for your American readers. Skyers - Oh, I cover my face when it is like that... my balaclava is the type you can pull open under your chin, or cover cheeks mouth and nose if needed, which I did.